The long-run trend rate of economic growth is the average sustainable rate of economic growth over a period of time. The long-run trend rate is determined by the growth of productivity and growth of long-run aggregate supply. (LRAS). If actual growth is higher than the long-run trend rate, then we get inflationary pressures. If growth is below the long-run trend rate, we get a negative output gap and inflation. This occurs when actual output is less than potential output gap. This is also called a deflationary (or recessionary) gap. In this situation, the economy is producing less than potential. There will be unemployment, low growth and/or a fall in output. A negative output gap will typically cause low inflation or even deflation. 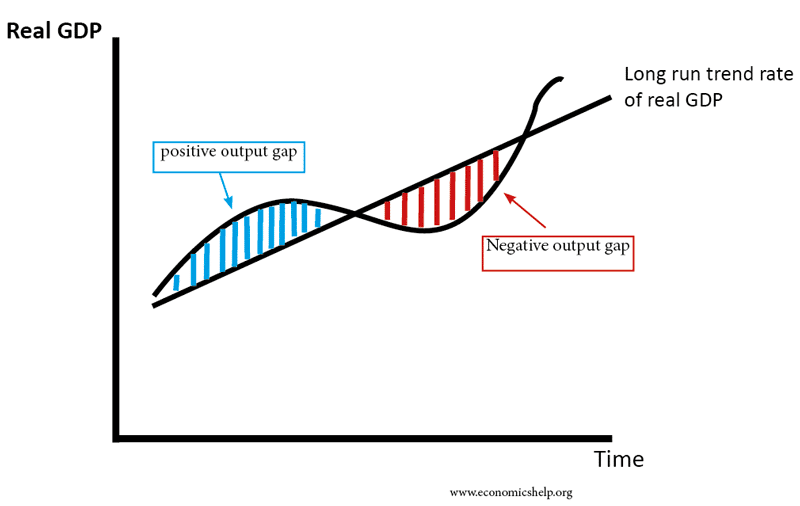 A negative output gap may imply a recession (fall in GDP) or just very low economic growth. A positive occurs when actual output is greater than potential output. This will occur when economic growth is above the long run trend rate (e.g. during an economic boom). It will involve firms asking workers to overtime. With a positive output gap, there will be inflationary pressures. It will also tend to cause a bigger current account deficit as consumers buy more imports due to domestic supply constraints. 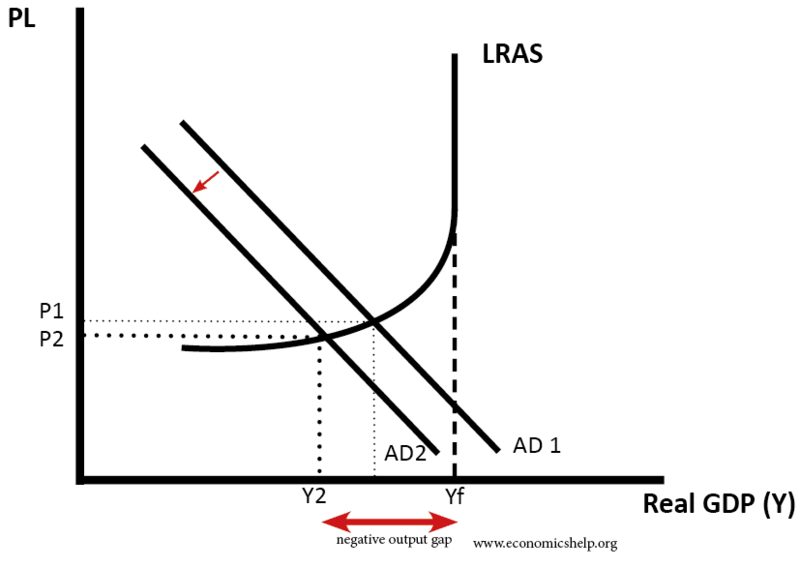 This shows a positive output gap with the monetarist view of LRAS. 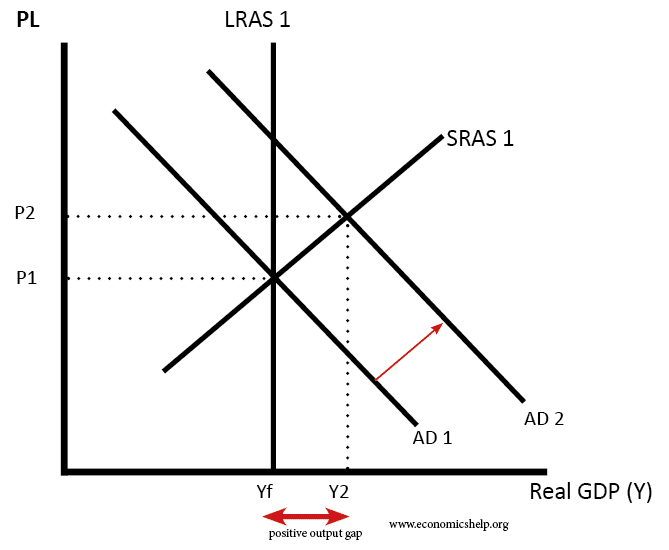 In this case, the economy is already at full employment, but there is an increase in the money supply and a further rise in AD. In the short-term firms can meet demand by paying higher wages and encouraging over-time. However, this short-term economic growth is unsustainable and leads to inflationary pressures. Output invariably returns to Yf – the level of full employment. 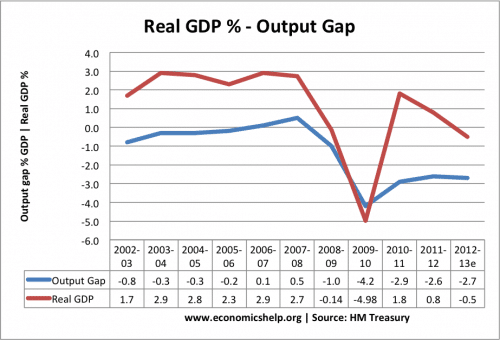 HM Treasury forecast an output gap of -2.7% for 2012/13. This is the amount of spare capacity they feel the UK has. 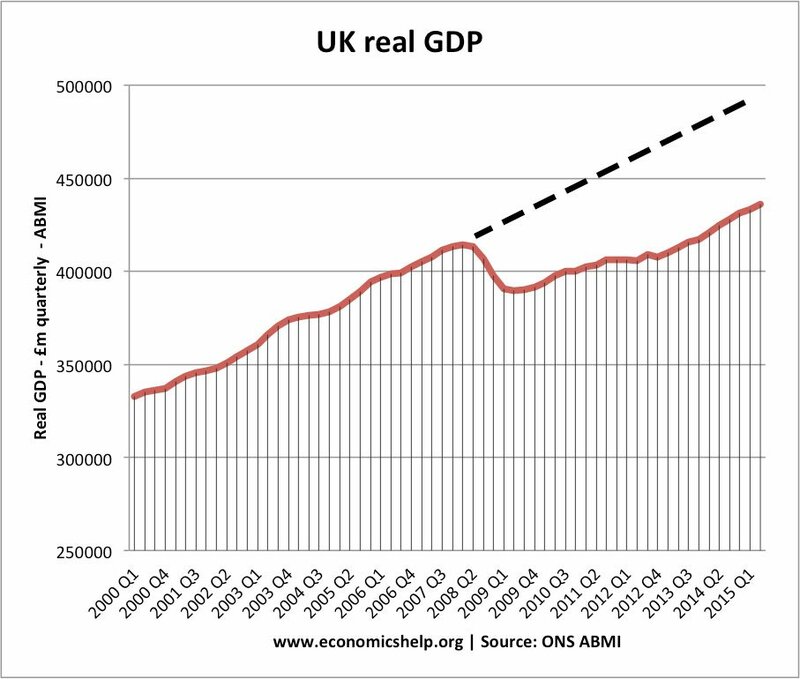 If we look at real GDP compared to long-run trend rate – it implies a very significant degree of lost output. Real GDP is approx 20% less than pre-crisis trend rate of growth. This shows that determining the output gap is a difficult decision. However, it has important implications for monetary and fiscal policy. If the UK has a large negative output gap, we should pursue expansionary fiscal policy and/or expansionary monetary policy. However, if there is a smaller output gap than we believe, expansionary monetary policy could cause inflation. Should the UK increase interest rates? – depends very much on whether we believe the output gap is closing. What Determines the Size of Output Gap? Level of unemployment. Higher unemployment increases the negative output gap. A fall in unemployment implies economy getting closer to the level of full employment. Firms reporting hiring difficulties. If firms struggle to fill vacancies this indicates a positive output gap. Wage inflation. Rising wage inflation, indicates firms are struggling to fill vacancies. Capacity utilisation. 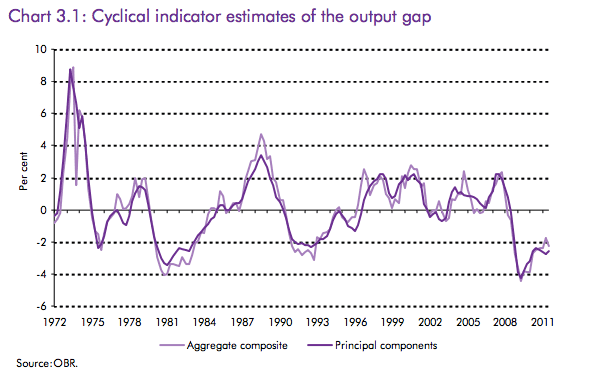 If firms report they are under-utilising capacity, there is a bigger negative output gap. 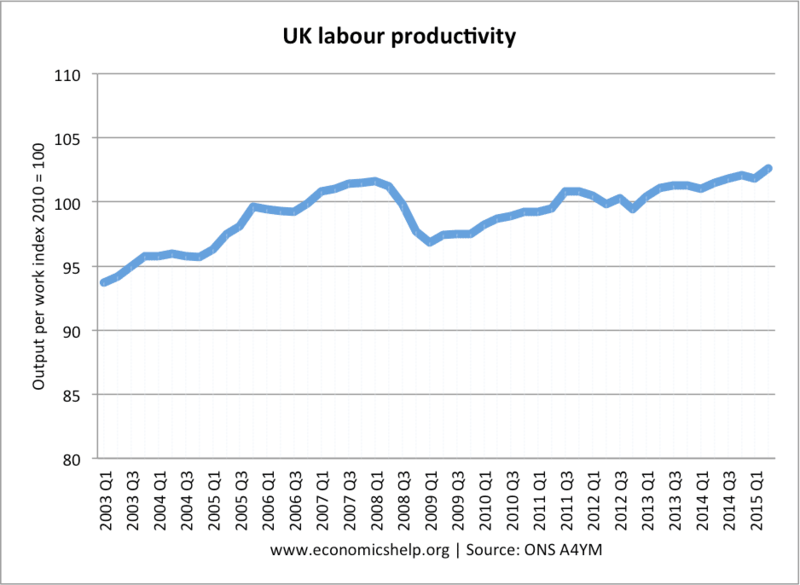 Productivity growth. If productivity growth falls, this decreases the growth of potential output and therefore limits the negative output gap. Inflation. Inflation can be a guide to the output gap. If inflation is high and firms pushing up prices, this suggests there is a positive output gap.